Outdoor Living.....Porches, whether front porches, back porches, or of the wrap-around variety, add plenty of charm and function to a home's facade. 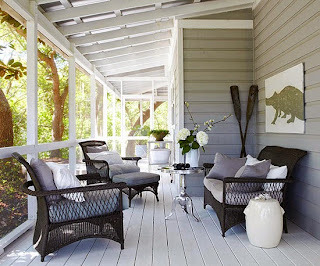 Treat this outdoor room like you would an indoor living room: outfit it with comfy, yet weather-proof furniture and fun accessories. 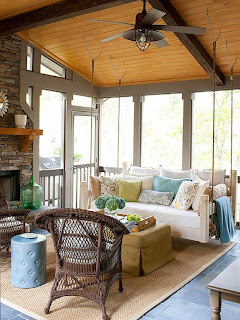 A swing bed is a unique piece of furniture that adds character and seating to a porch. To ensure safety, these beds are best hung by a licensed contractor. Here, a normal twin-size mattress was used for the bed. Add lots of decorative pillows to bring color and pattern to the space. Hang paper lanterns rather than the expected hanging basket for a touch of whimsy and the unexpected! Screen a porch so pesky bugs stay out, and the cool summer breeze can still come in. A screened porch makes a great place to have dinner when the weather allows. The screens still let the sunshine pour in and don’t distract from great views. 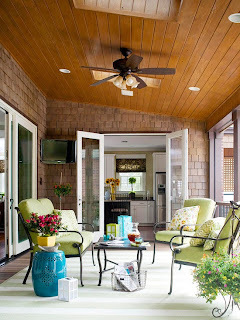 Add indoor touches, like a pendant, to an outdoor space to make it feel more homey and decorated. 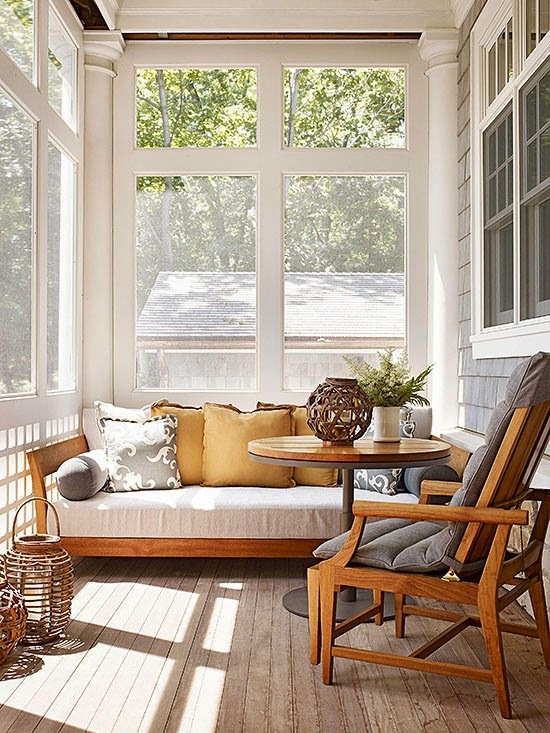 Organic textures -- whether the couch and chair fabric or the woven candle lanterns -- lend a beachy feel to this screen porch. 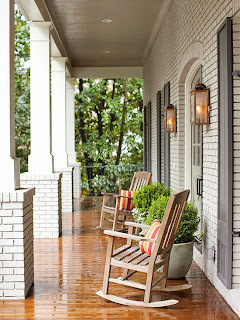 Columns and windows with obvious woodwork make this porch feel more like an extension of the home than a separate outdoor space. 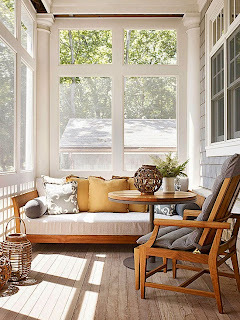 Incorporate a daybed on a porch, like the teak one on this porch, which works as a sofa for group gatherings or a sleeping perch for solitary afternoons. 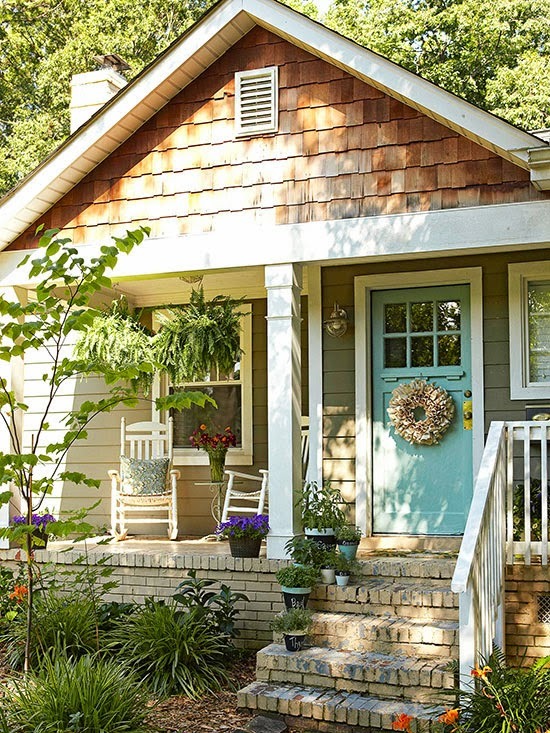 To spruce up any porch, consider repainting the trim or even the front door. Don’t be afraid to transform your door with a fun, bright paint color. 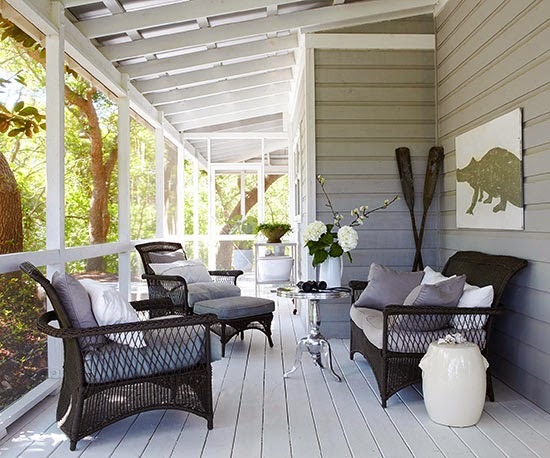 To make a seating area on a porch that lacks space, choose furniture that is slim rather than bulky. Here, a seating area was created with two rockers and a small side table. 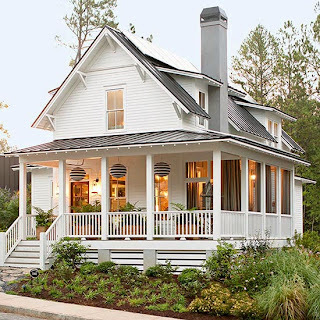 Enclosed on three sides, this porch has multiple entry points into the house. Glass doors bridge the gap between inside and out. Buying outdoor furniture that coordinates with furniture indoors is another way to create cohesion between both spaces. 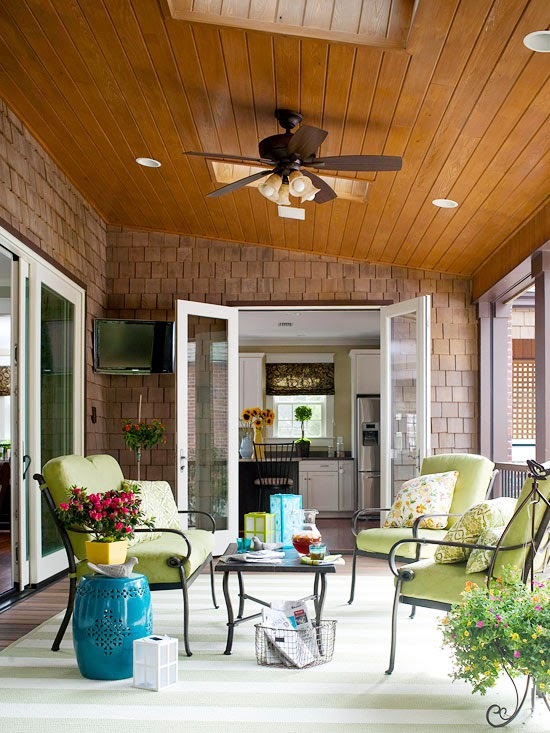 Create your own breeze with a ceiling fan designed for outdoor spaces. 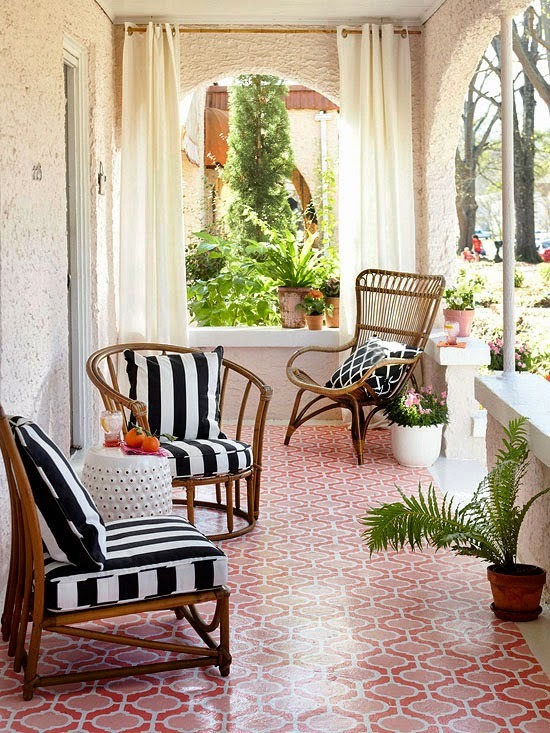 Use a stencil design to pump up porch floors and create a look that is all your own. 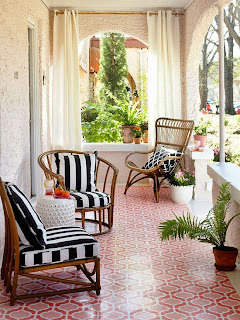 On this porch, the stencil pattern mimics Spanish tile, which is in step with the home's stucco facade. 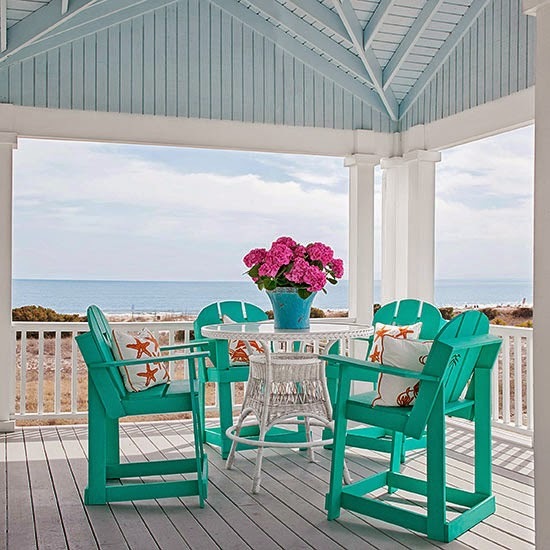 A porch is the perfect opportunity to play with color. Complementary colors are opposites on the color wheel but, like the tangerine and baby blue used here, will always pop and pair well together. To balance out the vibrant colors, the walls, ceiling, and two garden stools are all white. Texture in the wicker furniture, a woven basket, and a ceiling fixture also keep the space interesting. 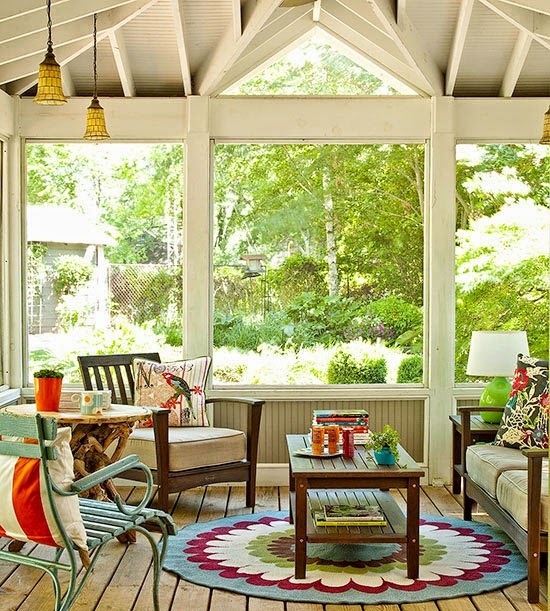 This wrap-around, screen porch uses several different types of materials to create visual interest. A metal table pairs well with the dark wicker furniture, porcelain garden stool, and worn wooden oars propped up in the corner. A mix of gray and white pillows keeps the color palette laid-back and subdued. 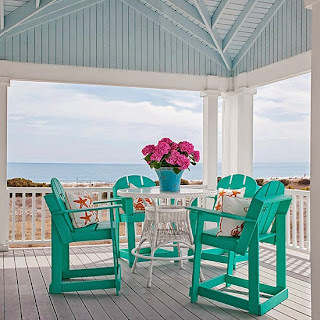 Have fun with color and paint on your porch. Consider an eye-catching paint color for the ceiling. Here, sky blue mimics the real deal and is bright even on cloudy days. 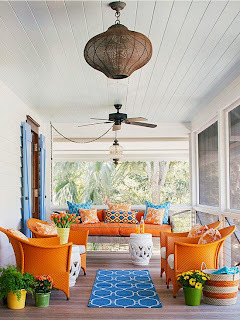 Reserve saturated, intense colors for furniture and accessories, like these teal chairs and orange patterned pillows. 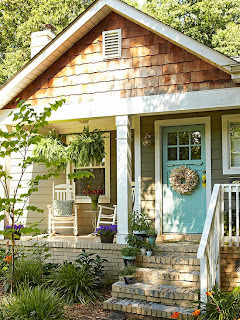 Just like indoors, simply adding a fresh coat of paint to the exterior of a house can change the entire look. Here, taupe paint gave old red brick a new, cleaner look. Since the porch isn’t very wide, the furniture couldn’t be bulky. Rocking chairs and potted shrubs convey a simple, symmetrical, and unified look.